The Flash Zone – Flash memory is a good candidate for filling this memory gap because it provides nonvolatile storage and it has become the cost-per-bit leader in semiconductor memory. 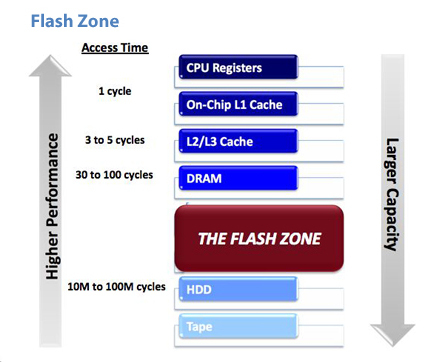 Consequently, Denali calls this performance gap in the memory hierarchy the “Flash Zone”, the performance zone between DRAM and HDD access times. Multiple technologies have vied to fill the Flash Zone. nvSRAM, such as those offered by Cypress, although a mature and cost-effective solution, are unable to scale to larger densities. More exotic technologies such as PCM, MRAM, and FeRAM also have scaling issues and are not yet mature. Time will tell if these technologies make it out of the lab to high-volume production. Designers have been limited to alternatives such as battery-backed RAM with the associated issues with batteries or living with the issues of slower NV memories, such as Flash, which do not perform well for random accesses or for write transactions. For many applications these are poor alternatives and have caused designers to implement alternative architectures, e.g. caches, to get around many of these issues while still not obtaining the best performance possible. However, now several trends in the industry are making these tradeoffs even more pronounced. Thus there is a growing need for higher density, high-speed non-volatile random access memories. And the traditional approaches are not adequate. In response to the need for a fundamentally better approach to implementing large, high-speed, NVRAM, AgigA Tech has developed the AGIGARAM® Non-Volatile System (NVS). 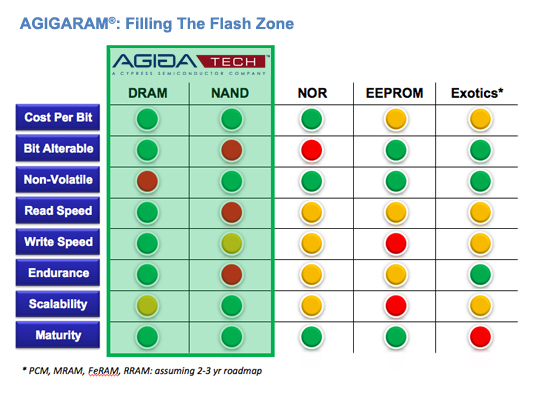 The AGIGARAM® product family merges NAND Flash, DRAM and an ultracapacitor power source (PowerGEM®) into a highly reliable non-volatile memory system. The innovative memory subsystem meets the needs of high-speed, high-density non-volatile RAM to offer the best fit solution to fill the “Flash Zone”. Learn more about our AGIGARAM® technology.